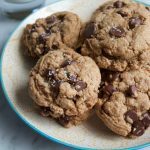 Before we get to this recipe today, I have some exciting news! I have a YouTube Channel!!! and some videos that we’ve been working on fast and furiously are UP! so, please take a look and subscribe to my YT channel! Thank you so much!!! Up until recently, I didn’t know how to properly cook a prime rib roast. And with the holidays coming up, I figured I needed to get this recipe down and under my belt. My family and I are big meat lovers and, this year, we’re changing it up and will be serving this, along with the turkey, for Thanksgiving. Heck, this prime rib roast may make another appearance at Christmas time too! Just look at this beauty. The important part of the preparation is actually what you do before the roast even goes into the oven. Did you know it’s important to let your meat come to room temperature before cooking it? This is a really important step because it helps to relax the meat fibers, which will make for a more tender juicy roast. Try this the next time you make a roast! Omaha Steaks has both a boneless Heart of Prime Rib Roast and a Bone-In Prime Rib Roast. In my opinion, you can’t go wrong with either one. Both are superior quality beef. 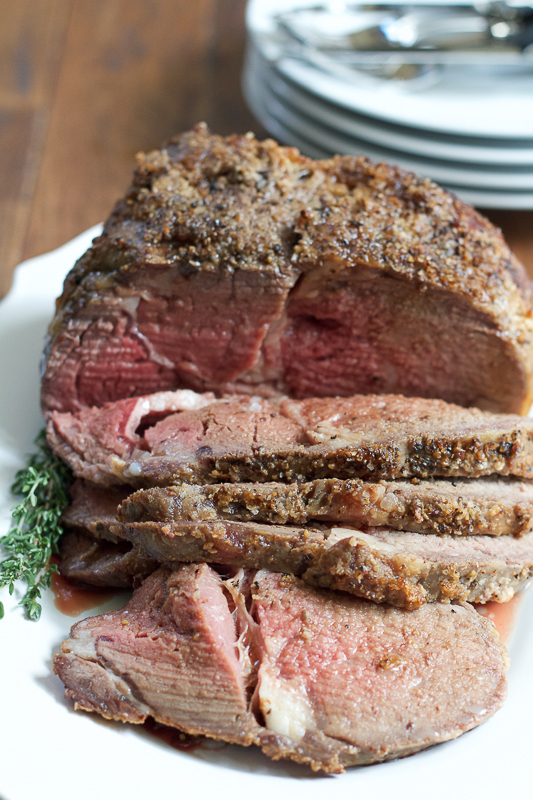 Omaha Steaks’ Boneless Prime Rib Roast is tender, juicy and incredibly easy to prepare. We were blown away by the tenderness and taste. And because we are a family of four, we had some leftovers to re-heat and the prime rib roast tasted just as delicious a few days later. So, think about this Prime Rib Roast for the holidays or even for an upcoming family gathering or special dinner. You, your family and your guests won’t be disappointed! This roast is unforgettable. Note for the cook: There are some recipes that slice cuts into the meat and put fresh garlic cloves into the cuts of the meat. Use this recipe as a basic method of preparation and adjust to your preference. Pat your prime rib roast dry using paper towels and place on a rack in a roasting pan or casserole baking dish. Let sit out on the counter for about 2 to 3 hours so the roast can come to room temperature. When ready, preheat your oven to 450 degrees. Season the prime rib roast generously with salt and pepper, on both sides and roast in the oven for about 20 minutes. After 20 minutes, reduce the temperature to 350 degrees and continue cooking for about one hour, or until a meat thermometer reads 130 degrees F.
Remove from the oven and onto a cutting board or another dish and cover with aluminum foil and allow the roast to rest for about 20 minutes before slicing. Place the roasting pan on the stove over medium-low heat. Whisk in the Worcestershire sauce and the red wine and scrape up the browned bits at the bottom of pan. 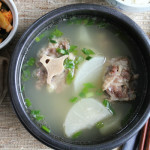 Turn up the heat to medium-high, pour in the beef broth, mix together and bring to a light boil. Reduce the heat back to low and let simmer for about 15 to 20 minutes, stirring occasionally, or until the sauce is reduced by half. Serve with the prime rib roast. 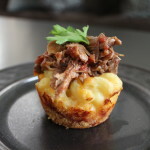 For the complete recipe card and full instructions, please visit SteakBytes.com. Disclosure: This is a paid, sponsored post in partnership with Omaha Steaks. All opinions are 100% my own. Thank you for supporting me in working with the brands and products that I use and love. I love Prime Rib, but never cooked it myself! 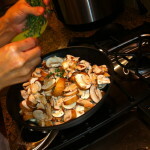 Need to get some from Omaha Steaks and try your recipe ! Pinning! I am so glad I’m not a vegetarian at this moment! This looks delicious, let me at it!!!!!! You knocked it out the park for a first timer! 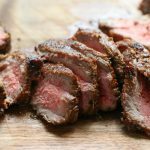 I’ll admit it right now, roasts scare me – I made a beef tenderloin roast last Christmas and pretty much gave myself a nervous breakdown (it came out fine!). 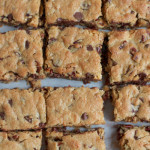 I think this year I need to do a test run ahead of time with your recipe – it looks mouthwatering! I shook things up last Thanksgiving by making a ham instead of a turkey – THAT will be the new tradition. So good. My sister is the one who hosts Christmas, and she always and will forever make a prime rib, thank goodness! One of these days I will learn how to properly cook one, too. Christmas is too far away…you’ve inspired me to make one sooner! I love Prime Rib, but have never cooked it myself! These tips are SO helpful and I’ll totally refer to them when I try out some prime rib! Pinned! Thank you so much, Cheyanne!!! 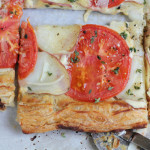 Goodness girl this looks beyond amazing! Seriously I just want one single bite that will turn into three or four or probably eating the whole thing. It looks that good. Thank you so much, J!!! Your YT videos are awesome, Alice! I totally subscribed 🙂 Love this roast! My mom usually makes prime rib whenever we have a big family get together but I’ve never made it myself either. Yours looks amazing and I love your tips! Thank you so much, Kelly!!!! I appreciate it! Seriously drooling over here. Looks amazing, Alice. Looking forward to checking out your YouTube channel. I saw all the teasers on FB and looks like you had a lot of fun! 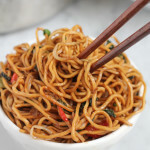 I want this for dinner tonight! It looks so perfect and flavorful. Can’t wait to check out your new YouTube channel, Alice! Ah, Garrat would be sooo happy if I make this for him. This sounds really good, Alice! 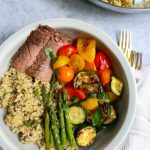 Hopping onto Omaha Steaks site for the recipe…. Prime Rib always makes an appearance on our holiday table – so, you know I am loving this!! And congrats on your YouTube channel – I’m heading over right now!! YAY! I have never cooked prime rib before. We love to order it if it’s on the menu when we go out. I bet it’s 100 times better made at home, though. I just watched your Kimbap video! I love watching cooking videos on YouTube almost as much as I love kimbap. Seriously tastes like childhood (just add one of those little yogurt drinks with the foil lid)! Aw, I love your videos! I have been waiting to see them! 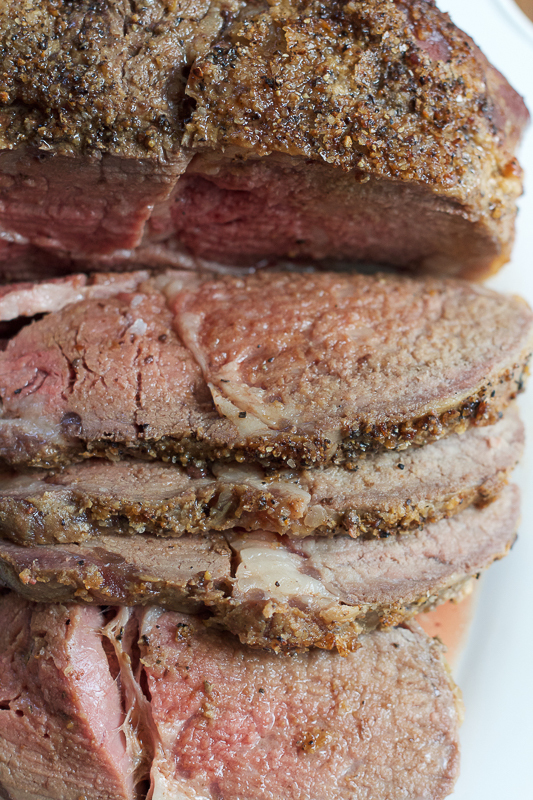 I have actually never cooked a Prime Rib Roast either — this is so helpful! There is just something about a roast that always makes my mouth water. 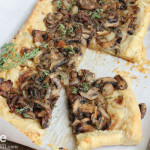 Your recipe and a glass of red wine will put me in a happy place! 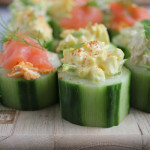 Alice – I subscribed and LOVE your video on making Kimbap! You are such a natural on camera – why are you not on Food Network???? I think your agent needs to get you on the Next Food Network Star or something! So I’m gonna stop gushing now and say – I’ve never made a prime rib – I’m pinning this in case I need to woo someone with it someday! I am totally drooling right now Alice! 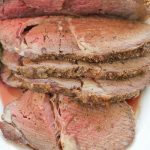 Prime rib is one of my all time favorite dinner and yours looks like it would not disappoint! I think I’ll be seeing this in my dreams tonight! 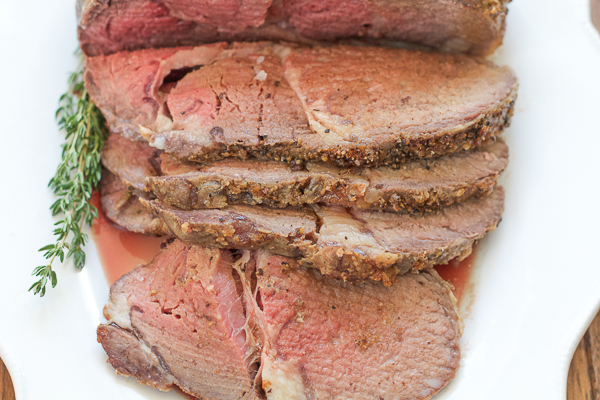 We love prime rib roast and have them on almost every important holiday and special occasion. Seeing yours makes me wish today is Christmas and I had it on my plate! Leftovers make amazing cheesesteaks too! Alice! Congrats on your YouTube Channel! I’m already a subscriber and I can’t wait to see all the new videos you are going to post. Also this prime rib is glorious. I’m not a huge meat-lover myself, but my husband would die for this! 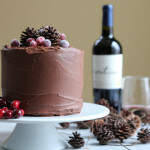 This is the perfect thing to serve for Christmas! I’ve never made prime rib, can you believe it? I’m pinning this bad boy to try! Congratulations on your channel Alice! I watched the interview with you! You’re a natural! Love the kitchen, is it yours?? Congratulations on your YT Channel! I’ll hop on over and subscribe. We love Prime Rib for Christmas dinner, but I always have to remind myself beforehand, the best method, time/temp etc. beforehand. We just don’t make them that often. Why that is I don’t know! This looks gorgeous and inspiring.. and a perfect addition to the Thanksgiving table. Love, love. This would definitely be perfect on Thanksgiving or Christmas. It looks amazing! And congrats on the YouTube channel! Yum! There is nothing like a prime rib is there? I am loving your Youtube channel! Alice Choi – next Food Network star! I LOVED your videos! The tips were great, I loved how you incorporated childhood stories, your mom, and it was really cool to actually SEE you as you are – I love it! Congratulations! I can’t wait to see more! So onto this amazing roast! This reminds me of a dish my mom used to make all the time when we were growing up. This is such comfort food for me. Pinned, of course! I love rib roast that is cooked with that lovely pink center. Sadly, my husband likes his charred, like leather. It’s such a tragedy. So I’ll just have to make two. One ruined for him, and one perfect one just like this! I can’t wait to try it your way!